I went to a little "Baptism Preview Fireside" a few weeks ago to talk to the seven year old kids in our ward about what would be happening in the next year of their lives, the year they turn eight. 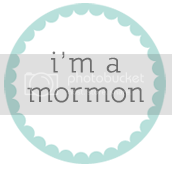 It's a big year for LDS children because it's the year they are baptized. My part was very small, once the boys turn 8 they get to start coming to cub scouts so I was giving them a little intro to what we do each week and what they can look forward to. I sat down and I'm sure none of the parents or the boys remembered what I said at all, but I have not been able to stop thinking about an oriental parable the primary president shared ever since. I decided it will be the basis of my New Years resolution for 2014. There was a merchant man seeking precious jewels who finally found the perfect pearl. He wanted to put it on display for all the world to share his priceless treasure. He sent out for the finest woods and had them polished until they shined. 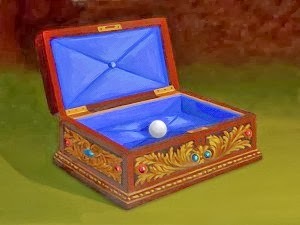 He had the most skilled craftsmen carve out a beautiful box and lined it with blue velvet to hold his jewel. Once the pearl was on display people came from miles and miles away to see it, but as he watched them, the man turned away in sorrow. He realized it was the box they admired and not his precious pearl. She shared this with the children's parents as a reminder to them that they might want to plan things to help make their son or daughter's baptism day special, but that they needed to remember what was most important. The ordinance of baptism is beautiful and priceless all on its own and we need to keep that the focus of the day and not draw away from it. I don't have a seven year old who is anticipating baptism but this parable just struck me so hard. I thought about all the hundreds of wedding pins that come across my Pinterest feed, and wonder if the brides-to-be remember that really the day is about God's ordinance of marriage. I thought about Winston's first birthday party and all the hours I spent planning and preparing, wondering if it had taken attention away from my little pearl. My New Years resolution is to focus on the pearl. I will spend less time making the pearl a pretty display, and more time polishing the actual jewel. I will spend less time on the amusing, the entertaining, the accessories and embellishments of life, and more time on the important. I read somewhere that most people spend 95% of their effort on only 5% of their life. How unbalanced! This year I resolve to pay more attention to the crucial, the meaningful, the necessary, the vital, and give it the effort it deserves. This is the perfect New Years Resolution. Thanks for sharing the story, I LOVED it!